T-Mo customers, don't get jealous of everyone pre-ordering an iPhone 4S, you've got your own super phone ready to hit retail channels -- the Galaxy S II. As promised, the 4.5-inch variant of Samsung's current flagship device hit T-Mobile's site today for pre-order and is expected to start popping up on retail shelves on Wednesday, October 12th. If you want to make sure you're one of the first on Big Magenta to leave your fingerprints on its sizable Super AMOLED Plus screen, head on over to the carrier's site now to put in your order. The privilege will set you back $230 with a two-year contract. 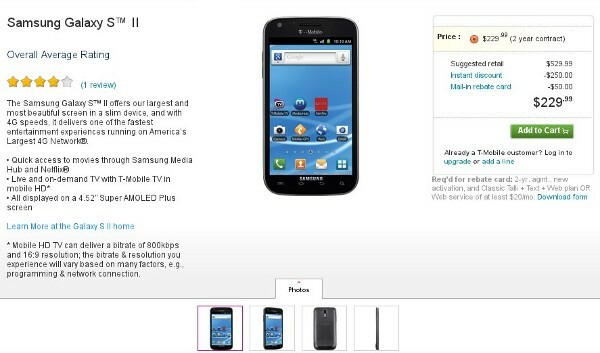 T-Mobile Galaxy S II pre-orders begin today, should land in stores October 12th originally appeared on Engadget on Mon, 10 Oct 2011 12:18:00 EDT. Please see our terms for use of feeds.